For the past 37 years, Bay Area residents Janice Kostello of Washburn and her sister Dawn Nabozny of Ashland have wondered what happened to their brother, U.S. Marine Lance Corporal Raymond T. Heyne, a 20-year old Marine artilleryman serving with the First Marine Division in Vietnam. 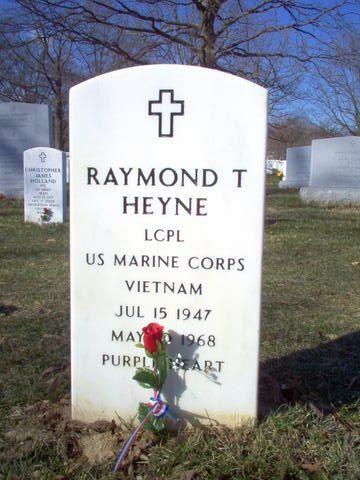 Heyne had been at the American base of Da Nang for about two months when he and 43 other members of Platoon Delta X-Ray were ordered to the forward operating base of Ngok Tavak near the Special Forces Camp of Kham Duc to counter a North Vietnamese push against Kham Duc. In he battle that followed, described by those who were there as one of the most ferocious of the war, both Ngok Tavak and Kham Duc fell to overwhelming numbers. The small force at Ngok Tavak held out for more than 10 hours until they were forced to abandon the position. In the fight, a dozen Americans, including Heyne were killed. Because of the ferocity of the battle, it was impossible to recover their bodies. The battles of Ngok Tavak and Khum Duc remain as one of the most heroic stands of the entire Vietnam War. Due to the isolation of the site, it was never possible to recover the bodies of the slain. Since there was no body, Heyne was listed as missing, and for 37 years, for members of the Heyne family there has been no closure, no certainty about their brother's fate. Over the years, there have been rumors that he was taken prisoner, and other disturbing tales that could not be disproved. Until earlier this year, that is. In May, remains positively identified through mitochondrial DNA matching, confirmed that Heyne had been killed on the battlefield. The DNA evidence was found in three teeth that were discovered during painstaking archeological digs on the battlefield. In addition, a single stainless steel dogtag belonging to Heyne was also found. He is among 11 Marines and one Army Special Forces soldier whose remains have been identified. The announcement ends nearly four decades of not knowing what happened to their brother for Kostello and Nabozny. "We were told right away that he was in a battle, although there was some speculation about what happened to him, the story was kind of conflicting," said Janice Kostello. "There was such a sense of the unknown about what exactly did happen," said Dawn Nabozny. Kostello credits the organization Vietnam Veterans of America with showing "exceptional determination" to find out what happened to their fellow servicemen. "The whole organization is what basically got the government behind this and have pushed so hard to get the repatriation of their remains," she said. The battle in which Heyne was killed produced the single largest number of missing Americans associated with any battle of the war. Some 32 men were unaccounted for by the end of the fight. "We are pleased that after more than three decades the families will be able to benefit from the recoveries of their loved ones," said VVA President Thomas H. Cory. "It is common knowledge that this battlefield would never have been excavated had not VVA sent in teams of veterans to Vietnam," said Bill Duker, former chairman of the Veterans Initiative Task Force. The recovery of the remains of the American servicemen is an extraordinary tale of cooperation between former enemies to resolve one of the lingering issues of the war; a full accounting of all the missing on both sides. American team members extensively interviewed their former enemies, including high-ranking North Vietnamese officers to get information about the missing men. The team included linguists, explosive ordinance technicians, mortuary affairs specialists, and forensic archaeologists who painstakingly uncovered the battlefield, sifting earth to find fragments of clothing, bones, teeth and dogtags that helped identify the men. It is part of an ongoing process that has so far identified 748 Americans who were listed as missing. Some 1,800 men continue to be unaccounted for. According to Kostello, one man who has had much to do with the success of getting the effort organized is former Marine Corporal Tim Brown, who was a member of Platoon Delta X-Ray, but was medically evacuated with a case of pneumonia before the battle took place. "He has been a very good friend to me," she said. "He has kept me updated, sent me DVDs of the excavations, he's called me. He's a friend." Brown said the effort to find the truth about the missing men of Ngok Tavak began after the surviving Marines began to get back in touch with each other after the war. "We also began to get in contact with a few families as best as we could, and because of the fact that some of the initial reports were not factual concerning the fate of these 11 Marines and one Special Forces soldier who were killed in action and their bodies not recovered," he said. Brown began to collect after-action reports and other documentation in an effort to find out the truth. "When I became a ranking member in Vietnam Veterans of America, I persuaded the POW/MIA committee of VVA to take up what later came to be known as the Khum Duc/Ngok Tavak project," he continued. Brown took teams of veterans back to the old battlefield in 1994, 1995 and again in 1998, providing the U.S. Government with maps, videotapes of meetings with Vietnamese officials and veterans, and minefield locations. The work done by VVA led to the safe and productive recovery of the remains found at the battlefield in 1998 and 1999. Brown said the Veterans who made those trips had personal stakes in the effort. "Our friends, our brothers were left behind on the battlefield, and that is something that just troubled all of us for a number of years," Brown said. "But at the time, tactically, the remoteness of the location made it impossible to get them out at the time. Given that, plus the fact that the families were led to believe that they died in different fashions than they actually died, raised all the more the more interest to get at the truth." Kostello said he news that her brother's fate was now absolutely confirmed was a relief. "Finally the doubts were lifted. Finally, there is closure," she said. She said she especially prized her brother's dog tag, which was discovered at Ngok Tavak. "This means so much to me, that they found this. All these years we didn't know if they were captured, were they killed, were they taken alive for a while and then killed, we had no idea," she said. "There was doubt in your mind about what could have happened." "It does resolve the questions that have lingered, for so many years," Nabozny said. Kostello said she and her sister plan to bury the dogtag at an existing empty gravesite memorial to her brother next to their parents graves. Kostello said the ceremony will be both sad and a celebration. "He's finally going to be home," she said. 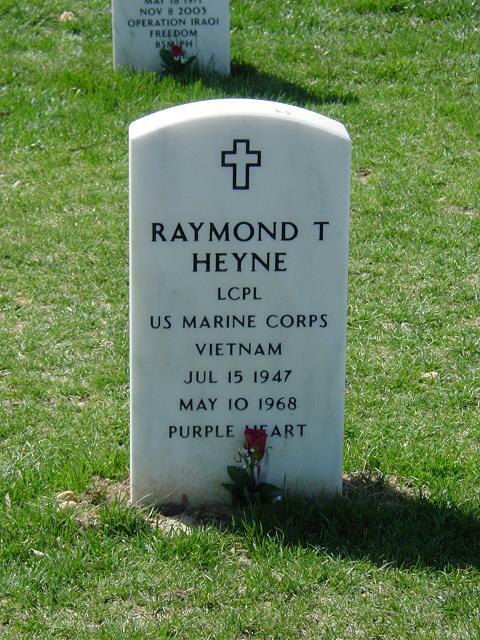 Heyne's recovered body parts are to be interred at Arlington National Cemetery in Washington. The sisters hope to have the ceremony for their brother timed to coincide with a common burial service at Arlington for unidentified American remains found during the investigation of the battlefield. They hope to have the event in early October when a reunion of the survivors of the Kham Duc/Ngok Tavak battle is set to take place in Washington D.C.
"I cannot think of any more appropriate time for this to occur," Kostello said. "It is an appropriate place to have the ceremony because there is going to be a common grave for those fragments that were not able to be identified by DNA," said Nabozny. "It will keep the comrades in battle together."